May is deck safety month according to NADRA, the North American Deck and Railing Association. As soon as spring and summer roll around, most likely your entire family will start spending time on your deck for dinners, parties, and just hanging out. The deck is the perfect hosting site for such an activity, but if you haven’t been maintaining your deck, you might end up with a costly and potentially dangerous situation. This article will discuss some general deck maintenance tips you can use to help your deck last for years. This may seem rather obvious, but there have been a number of preventable accidents in which a deck has collapsed because it was improperly built. To ensure the same accident doesn’t happen to you, hire a professional home inspector to inspect your deck for any safety hazards. Because your deck sees a lot of abuse from the elements, you’ll want to keep an eye out for signs of wear and tear, particularly on the ledger board. The health of this board is crucial as it connects your deck to your home and is the main site of support for your deck. 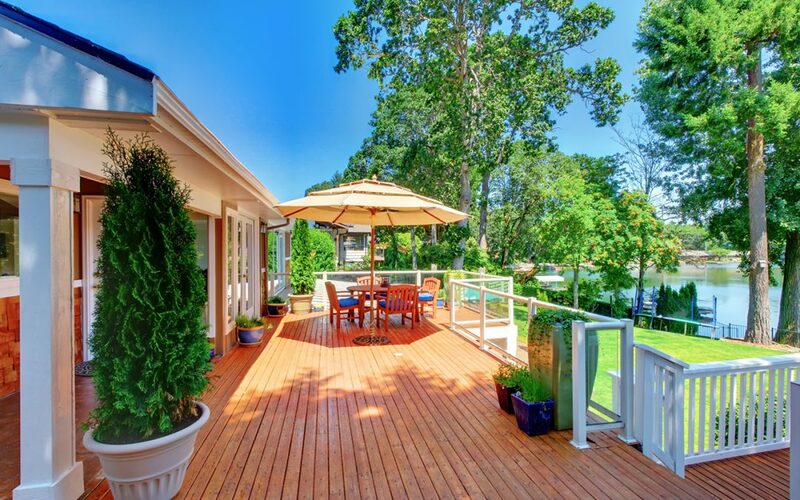 Depending on what they say, you can follow through with some of these deck maintenance tips. Before you can do anything fancy to your deck, you need to clean it. This is, perhaps, the easiest form of deck maintenance that you can do to keep it functioning longer. By keeping the dirt and build-up of chemicals that may have found its way onto it over the season, you’re ensuring that the wood isn’t slowly eaten away. Be mindful if you intend to use bleach on your deck as it might leave the surface of your deck washed out and faded. Instead, you may want to use non-chlorine bleach or a product that contains oxalic acid, particularly if you intend to remove stains and areas of discoloration. There are a few key painting notes that you should take into consideration when performing your deck maintenance. The first is if you want the natural wood to be front and center, then you want to make sure that the coat you’re using is either clear or a light stain. Second, is that you need to prime the wood first with something that contains either a stain-blocking oil or an alkyd. Once you have primed and painted or stained the deck, you will be left with the choice of finishes. To receive best results that last, choose a finish that soaks into the wood instead of creates a film over it because this can peel and wear over time and make your deck look old and dated. You’ll want to make sure that the finish is water repellent, has UV protection, and mildewcide which preserves the wood and keeps mold from growing. With all of that finished, top it all off with a good dose of sealant. This further preserves the wood. Oil-based are the best type of sealants, but be aware that some might come with tints of color. JS Consulting Group, LLC is a home inspection and consulting company based in Southern California serving Los Angeles, Riverside, San Bernardino, and Orange Counties. Contact us to schedule an appointment.